There are 4 new belay devices coming to the US market in 2017. Read on to see what the Black Diamond ATC-Pilot, Edelrid MegaJul Sport, Petzl GriGri + and Wild Country Revo all have to offer. A word of warning to the avid multi-pitch climbers out there: this year’s selection is stacked with brake assist devices designed for gym and single-pitch climbers. If you can’t see the video at the top of this page featuring these 4 belay devices, you can watch it directly on YouTube or Vimeo. The ATC-Pilot is a single rope semi-auto tuber with enhanced braking. When your climber falls (top-roper or lead climber), the device will seemingly catch the majority of the weight and hold the climber until your hand rotates the device and releases the rope. It’s essentially constructed from two pieces (4 if you count the pins): the rope bearing surface is an injection molded stainless steel part to reduce wear, and the main body is a lighter weight but tough Grilamid® which is 20% glass filled nylon. All carabiner/rope combo’s will give different braking characteristics, but an HMS/Pear style carabiner is recommended. This is because some small offset D shaped carabiners may have a basket geometry that prevents the carabiner from rotating properly in the device. The ATC-Pilot would still lock, but it won’t release if the carabiner can’t rotate in the device. The ATC-Pilot has been getting a lot of flack for looking and operating similar to the Salewa Ergo, Edelrid Jul² and Mammut Smart. Yes, it looks similar and it performs similarly, and Black Diamond isn’t claiming they invented the concept; the ATC-Pilot is just their take on it. Just as almost every climbing company sells multiple styles of tube devices, we suspect the semi-auto tuber is going to become a very prevalent style of device in the next few years. The MegaJul Sport is what happens when you take the smooth performance of the Jul² and bring it to a double-tube device like the MegaJul. The MegaJul Sport also has a beefier frame and more sculpted rope bearing surfaces. It also has a larger thumb loop making it easier to get your thumb into the loop while belaying as well as providing more leverage for smoother lowers/rappels. During rappel, you have the choice to use the device as a regular tuber or you can flip the device around and have brake-assist on rappel. Along with the MegaJul, this Sport version is one of very few devices made that has a brake assist method on a double rope rappel. To ensure the best performance, the MegaJul Sport can be partnered with the Bruce Steel carabiner. Having a steel carabiner is ideal because the MegaJul Sport is also made of steel and can cause nicks on aluminum carabiners. By using all steel parts climbers can will have a setup what will not wear out. The MegaJul Sport is intended for crag climbers that want brake assist capabilities while belaying and rappelling. Multi-pitch climbers should take particular note that this device does not include the guide mode loop like the original MegaJul. Anti-panic system: if you pull the handle to far, the cam will re-engage and lock up, similar to the CAMP Matik. To reset the cam, release the handle and start lowering again. A belay mode dial to switch between lead mode and top-rope mode. Lead mode reduces the sensitivity of the cam, allowing you to feed slack faster without the device catching. Top rope mode makes the cam more sensitive to help keep slack out of the system with the rope nice and taught. A stainless steel plate increases wear resistance in high abrasion areas. Smoother lowering. The geometry of the camming mechanism have been modified slightly to create a smoother, more friendly lowering experience. Extended rope range, accommodating 8.5 – 11mm. If you’re not into the extra features, no problem; the GriGri + is going to be a new addition to the GriGri family and will not replace the much lighter and streamlined GriGri 2. The Revo is so innovative we included it on our list of the 8 most innovative climbing products we saw at the Outdoor Retailer trade show. The Revo is symmetrical. This means you can hold it in either direction, load the rope in either direction, and then clip it to your harness in either direction. This also means you can also belay from either side (lefties can rejoice!). It functions as a brake assist device but is used exactly like a standard tuber. This means there are no new skills to learn, and it reduces the chances of an accident when switching between devices. The only time the assisted brake functionality is activated is if the climber falls when there is slack between the device and your brake hand. In this case, the Revo catches the climber once the rope running through the device reaches 2 meters per second – which is near the threshold of speed of a very aggressive payout of rope while lead belaying. The rope feeds very smoothly because it’s running around a spinning wheel that doesn’t add any significant bends or friction to the handling. The jaws of the device also offer sufficient braking and holding power akin to the teeth on a standard tube device. The Revo doesn’t require a panic override because 1) there’s no handle to release the braking mechanism and 2) it’s actually panic proof. Even if the belayer has let go of the brake side of the rope completely, and is holding onto the jaws of the device (akin to holding open the cam on other mechanical brake assist devices, the worst possible situation) a backup lock will still catch the falling climber and arrest the fall. This is not to say you should ever take your hand off the braking side of the rope, but know that Wild Country has put in an immense amount of design effort to make sure the device will still function properly in the worst case scenario. Another new belay device about to come out (it hits the market September, 2016) is the Trango Vergo. The most unique feature of this device is that it there is a an area on the left of the device, that when squeezed, can momentarily disengage the cam to be able to pay out slack quickly. The device continues to function normally as you pay out slack and the brake hand never moves during this procedure and the device is never “overridden.” This get’s into semantics a bit, but the lack of manual override is key here. If a lead climber falls while the Vergo cam is disengaged, it takes no additional effort for the belayer to catch the climber as normal, the device will still work as expected. On other devices, a manual overriding of the cam means that the belayer has to actively stop overriding the cam before the device can catch the climber. Another big difference compared to most brake assist devices is how you hold the Vergo during use. The Vergo is designed to be held flat (horizontally) which allows the belayer to feed slack with a more natural motion (pulling sideways) and reduces strain on the shoulder. We wrote a monster post about how the Vergo works and it includes videos explaining the features as well. Mechanical brake assist devices and semi-auto tubers will be the wave of the future. Expect the majority of the other climbing brands to come out with similar concepts in the coming years. This wave of devices specifically address additional safety measures. This is helpful at a time when there is a large surge of novice climbers but will also benefit seasoned climbers as many of these devices offer minimal downsides for substantially more safety. Can’t wait for these devices to come out? Will the Wild Country Revo function as a rappel device? It seems like it should, but WC makes no mention of it. The Revo will work for single rope rappelling. This is not the standard rappel technique that is commonly used with devices like the Black Diamond ATC-Guide or Petzl Reverso, that hold two rope strands at a time. 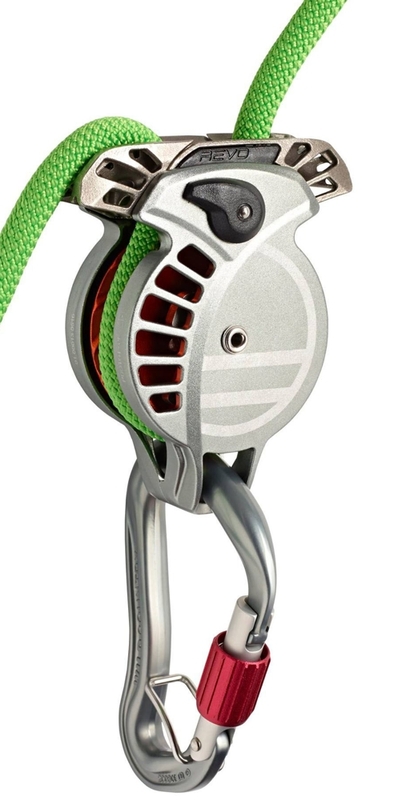 Since single rope rappelling is more of an advanced technique, the majority of climbers will not rappel with this device and will instead be lowered–This is the same limitation as the Petzl GriGi. When rappelling with the Revo, it will function very similarly to a single-strand tuber, like a Black Diamond ATC Sport but with the added safety of the locking mechanism if you were to lose control of the brake rope. Thanks Alison. I was thinking single rope raps or simul-rapping with one climber on each side of the rope. I’m excited for the Revo and final pricing to be announced. Totally! It’ll be perfect for simul-rapping. Though, for the record, it probably won’t be the best for multi-pitch belaying off the anchor because it won’t automatically catch the slack. The Revo only grabs when with the 4 m/s or manually locking by moving the jaw. And the final price for the US is $129.95.